THE PASSIONATE PRO-LIFER TURNED ABOLITIONIST: Why We Can't Wait! “On more than one occasion it has been suggested to me… to wait. The cause is just, but wait. The cause is worthy, but wait. The cause is righteous, but wait. 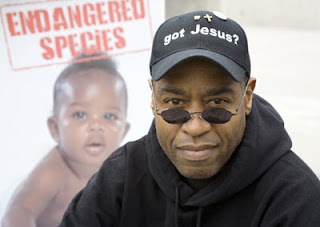 • The U.S. Center for Disease Control (CDC) and the Alan Guttmacher Institute (AGI), report that since 1973 more Black Americans have been killed in the womb than the total number killed by all other causes combined. • Certain Americans, (unborn children) are denied their full humanity, and like the slaves of the past they are treated as property, to be disposed of at the whim of another. • The number of children legally murdered each day in America exceeds the number killed on Sept. 11, 2001. We came together then. We must come together now. We must not wait! Hear Pastor Hoye at Church in the City ~ August 6, 2010 ~ 7:00 P.M.